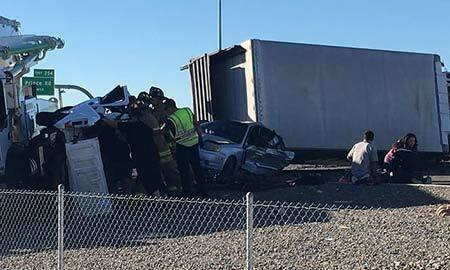 Tucson, Arizona—A seven vehicle crash, including two semi-trucks, claimed the lives of three people on Tuesday morning. The crash occurred on the westbound lanes of I-10 between Grant and Ruthrauff roads. Two of the vehicles involved were semi-trucks, one of which came to rest on its side. Rescue efforts required two medical helicopters and the “jaws of life.” Accident investigators have not released the names of any victims as the search for the cause of the accident continues. We extend our condolences to the families and friends of those who died, and we wish those who were injured swift and complete recoveries. Roberto Manriquez, Jr. and Alexandria Mendez were killed on Friday afternoon when a semi-truck crossed the center line and collided with the Ford F-150 they occupied. Aileen Alexia Bustos was killed when her vehicle collided with a Peterbilt semi-truck on Friday night. Jacqueline Pacheco was killed when the pickup truck in which she was a passenger collided with the back of a semi-truck last Saturday. Our personal injury lawyers and staff want to help you, in the unfortunate event that you need help. Just e-mail or call us for a free, no obligation confidential consultation. We have offices conveniently located throughout Arizona, including Phoenix, Mesa/Gilbert, Glendale, Tucson and Prescott.